NU’EST unveiled poster of their solo concert!! The group NU’EST's solo concert ticket reservation began. The agency Fledis Entertainment unveiled the poster for NU’EST's solo concert 2019 NU'EST CONCERT IN SEONO, which will be held in April, raising expectations. they unveiled a special motion poster, followed by an additional official concert poster. In the open unveiled poster, the five of NU’EST members are dressed in Navy color suits, posed in their individual style and released five-color of charms. Along with the members' chic and dandy appearance, it contains information on the concert with Segno. Especially, the first round of pre orders for fan clubs is began at 8 p.m. on 18. It’s able to book through interpark tickets, heralding a fierce ticketing. As it is the first concert in six years, attention is being paid to the concert. 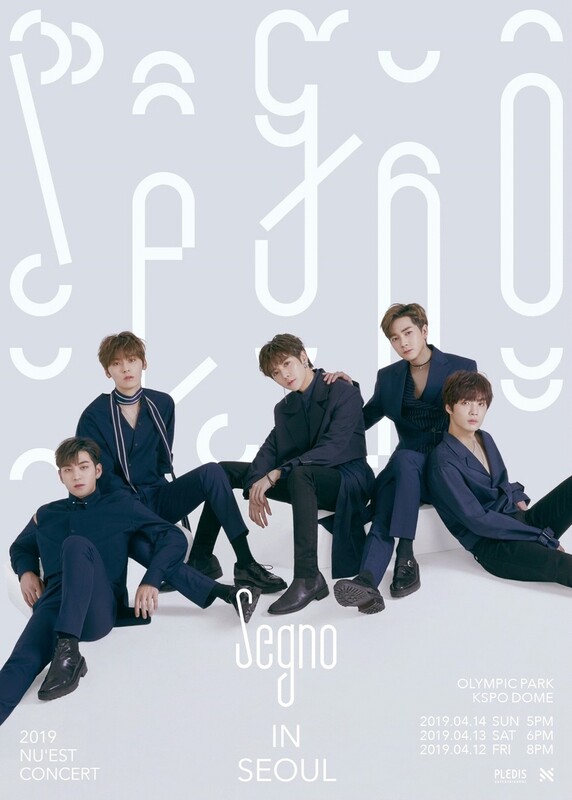 The 2019 NU'EST CONCERT "Segno" IN SEONUL will be a special time for both fans and NU’EST to communicate with the audience through a more colorful time, with a performance that will mark the full start of the members' activities. The NU’EST's solo concert will be held at 8 p.m. on April 12 and will be held at the KSPO DOME (Olympic Gymnastics Stadium) in Seoul for a total of three days at 6 p.m. on April 13 and 5 p.m. on April 14. Tickets will be held exclusively through the Interpark only, and the first round of advance reservations for the fan club open at 8 p.m. on 18 and the second round of advance reservations for the fan club open at 8 p.m. on the 20, and the general reservation open from 8 p.m. on 22.